You can get lost in this dawnbreak window shopping. And I did, so much so that when I turned around the subway grew. What was two men in short sleeve white oxford shirts, racing escalators when I first left had grown into a militia of salary men and women! The steady stream of determined faces blanked past me at dizzying speed. With few exceptions I saw man after man after woman, stony faced, moving mechanically toward some turnstile – some running, others progressing rank-in-file. Because I’d returned to trace my steps I was one of very few walking opposite this mass. It’s not easy to oppose organization away from home. I didn’t know where to turn – to whom and if then I should apologize? Could I duck into a coffee shop? Hope for wifi and call up work emails – thinking myself just as busy – if not more! – than the sea of salary before me. I wanted to do something local, convinced myself it was the motivating factor behind this morning jaunt. That my body wasn’t fighting jet lag – it was fighting for adventure. For a dying chance to make the most of day 2 in Tokyo. Somehow I convinced myself that it was very dangerous to be idle for even one day, less I lose momentum – should this opportunity fade as quickly as adventures past. I did NOT want to go to Starbucks, I reasoned. I wanted to do as that business man in a slightly tinted oxford did – so I followed him, stealthily. I watched him move away from the train turnstiles and out to the street. He moved with such ease – such urgency – that the follow felt more thrilling than the discovery. No sooner did we breech the hot open air of a Tokyo side street than he escaped into a low hanging doorway – a bunting of kanji strung taut across the frame. I watched him disappear and didn’t know what to do. Did he enter a place I didn’t belong? Was he at work – something mundane that would warrant too much translation and explanation were I to enter? Or was he someplace salacious – the entrance to a den of sin my imagination likened to foreign inhabitants. The trade secret of the working Japanese man. Perhaps I thought this out of fear for my husband – worrying he may assimilate- dismiss me as another white legged lady – clearly lost – in thought or direction – so close while so unaware of the exciting promise of this city. It was neither. Sense kicked in not to admonish me my story line, but in smell. It was a ramen shop. I breathed in the sticky scent of simmering pork that clung to the humid air and sloughed off my skin like a Chinese recipe. 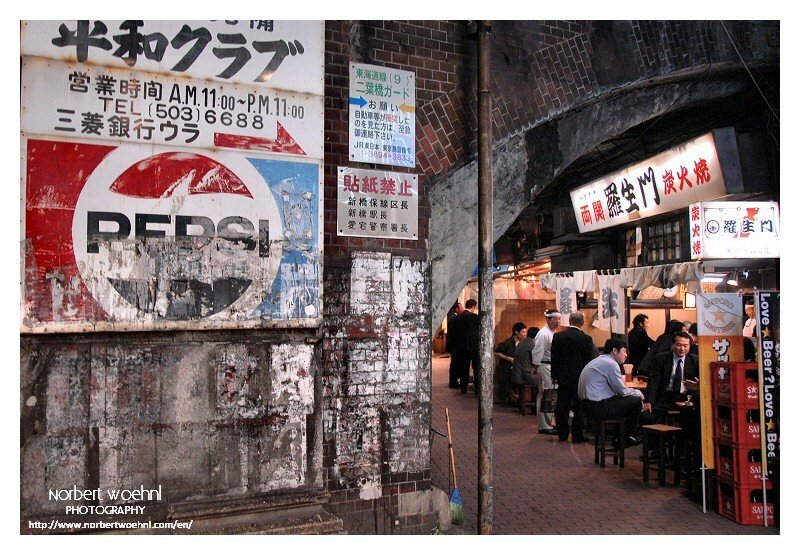 He was only eating ramen – when I focused on the reality of the situation I could hear the successive slurps of noodles. The streets weren’t noisy, but were full of sound as the business march carried on, and the slurps continued in metered time, like a heart beat. Slurp, slurp. This seemed my exotic chance! Ramen for breakfast? Why not?! Even as I thought through the logistics – how to order without my husband’s helping hand – what to order when I was certain I didn’t want pork in broth so early – I found myself moving back. Getting swallowed into the sea of moving professionals and leaving my chance behind – the noodle sounds waning until they termed. This all sounds more dramatic than it is. I found a bakery and sit here now, eating red beans baked into a scored pastry. I ordered coffee. I said I’d have it hear. I intimated all of this in a language I’ve failed to know and can watch what feels like the whole of the city process in front of me. Something struck me as I found my way in this cafe. It’s okay that I didn’t eat ramen. I’m so hard on myself for being adventure-less as I’m in the very thick of adventure. Being one of none long legged brunettes – jockeying for position – hitting the streets because there was no reason not to – may be the start of something. I mean, after all those twists and turns, I still need to find my way back.